Open Box with full manufacturer warranty or one-year B&H warranty. 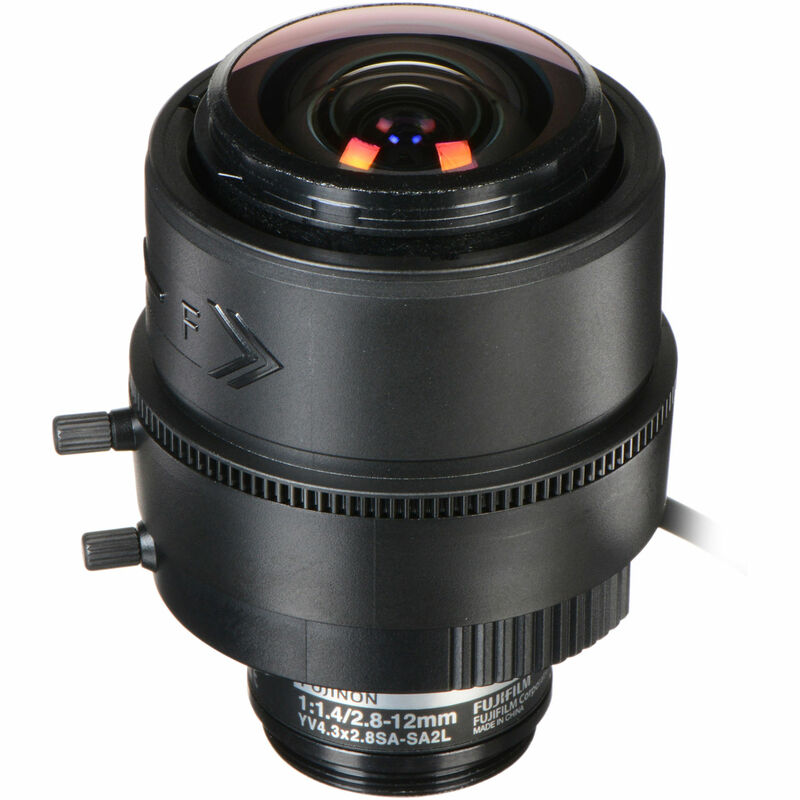 Compatible with 1/3" and 1/4" cameras, the CS-Mount 2.8-12mm Varifocal Lens from Fujinon can be used with up to 3MP resolutions for capturing high-definition images. The lens' 2.8-12mm focal length produces a 4.3x zoom for use with wide and tele applications, enabling you to use the lens in a variety of scenarios. Furthermore, an f/1.4 aperture allows for maximum light capture so that you can use the lens in low-light environments. Designed with an aspheric lens, the camera is able to achieve clear images up to the periphery of your field of view. There is a built-in ND filter which supports high sensitivity cameras, and the lens features an attached 9.1" long cable with a 4-pin plug for iris control. Equipped with a CS-mount, the lens is compatible with a broad range of cameras, and the mount is constructed of metal for strength and durability. YV4.3x2.8SA-SA2 CS-Mount 2.8-12mm Varifocal Lens (Long Cable) is rated 4.5 out of 5 by 2. Rated 5 out of 5 by SuperUser from Great Lens for 2MP Camera This lens seems solidly built and offers a great picture quality. Alos, the auto iris cd connection makes for a much more consistant image and the cable is long enough, without being too long, to connect to the dc port on all my cameras. However, i was a little suprised at the size of the lens but it makes snese that it is as big as it is since it allows for a 4.3x optical zoom. There is a very slight portion of the zoom that will not focus. Specifically, this is when the zoom is as wide as the lens allows. But it is such a small amount of zoom that I can easily forgive it.Overall, this is going to be my go to lens for when I need anything more than a 2.8x zoom. Otherwise I would use the 3 MP Varifocal Lens (2.8-8mm, 2.8x Zoom) since it's much smaller. Rated 4 out of 5 by Mark from Good Lens for HD Cams Nice lens for an HD-SDI 1920 x 1080 30P camera. Good zoom range. It's a Varifocal lens, as all are a slight pain in the .... to operate but once you have found your zoom and focus spot it is good. A little pricey but wanted good optics for 2.1mp camera. Hi. Would this lens work with the ASI120MM-S? Good lens. The instructions that come with it do not in any way help with its attachment and activation on a camera. I had to call the manufacturer and talk to a guy who said he's really only allowed to talk to vendors and helping me was an exception. All in all a great lens too bad they can't hire a decent tech writer for the install instructions.